Next Wednesday sees the Microsoft Imagine ’09 conference on London’s south bank, where the brightest and the best will gather to thrash out our digital future! The guest list reads like a who’s who of digital marketing with speakers such as Microsoft’s principal researcher, Bill Buxton, Pepsico International’s new media director, Claudia Lagunas, Fortune Cookie’s Managing Director, Justin Cooke as well as a host of others. The event is hosted by Laurent Delaporte, Vice President, Microsoft Advertising and has been organised by our long-term client AOK Events. 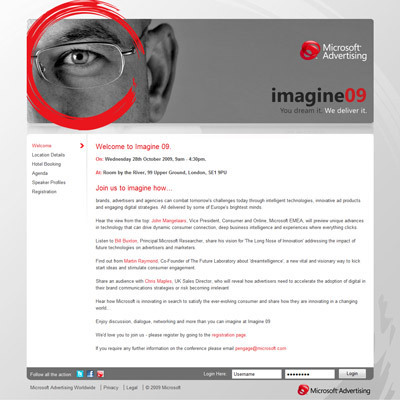 AOK and Microsoft approached us to construct the web site for this event – www.imagine09.co.uk – to act as the primary source of information and registration. The site is managed remotely by both Microsoft and AOK staff.